Editor’s note: This is the second installment of Sanctuary City, a fictional futuristic serial that appears regularly in Ecolocalizer. Read last week’s chapter here. The planet’s oceans turned into acid. The seas had already absorbed so much carbon dioxide from our pollution that their acidity levels had increased threefold in just the few years that she had been alive. Our saltwater had gradually been transformed into carbonic acid, and began dissolving the shells of living sea creatures, coral reefs and mollusks. The shellfish melted away, as did all of the other life forms that depended upon them. The entire food chain began to collapse; massive dead zones spread across all of the oceans, swathes of sea the size of continents, lifeless, anaerobic, putrid, stagnant, and filled with endless torrents of toxic oil. 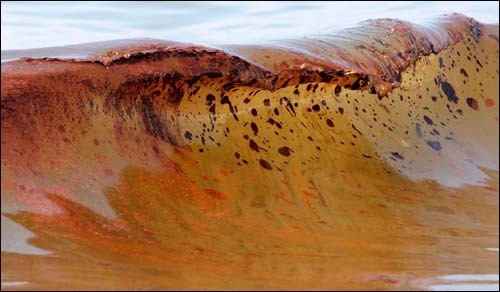 Each day more deadly methane and petro-chemicals continued to gush into the Gulf of Mexico from BP’s unstoppable oil spill. The extent of the death and destruction had become so great, that she could now feel the collective anguish and suffering of billions of creatures so many thousands of miles away. Living in a remote drizzly forest helped to dull the intensity of their pain that she felt. Being surrounded by thousands of towering trees and drenched in near constant rain helped to cleanse her damaged mind, and usually kept her from blacking out. Like many of her generation, Cedar was mostly homeless. Mass unemployment and imprisonment had swollen the “margins” of society to include nearly the entire populace. Very few people had health care or paying jobs any longer. Predatory capitalism and the ever-expanding military industrial complex had long since bankrupted the global economy; most basic government services, like mail delivery, safe food inspection and road repair, existed only in stories. Since there was no longer any pretense of regulation or oversight, the nation’s bank had stolen everything that it could, regularly charging over 300% interest, consolidating assets, and throwing dying people out of their homes. The obscene wealth gap between the plutocracy and everyone else had never been more extreme in all of recorded history. Many people committed suicide, or turned violent and killed their families, or tried to blow up financial institutions. The privatized military soon took over to defend the rights of our corporate overlords and permanently disappeared any agitators to black site prisons in Afghanistan and Palou. Cedar roamed from place to place, trying to avoid the refugee camps and other areas of great suffering; she foraged, grew food, repaired bicycles and attempted to scratch out an existence in squats and a series of temporary shelters. Her current location, an abandoned aluminum airstream in an isolated rain forest, had been her refuge this season. Today she was riding her bicycle 23 miles to the nearest farm collective to barter for supplies. After the death of capitalism, scores of small, independent cooperatives had begun to sprout up in some regions. Local people spun wool, made soap, baked bread or welded broken farm tools, in exchange for other resources and needed services. Her bike’s panniers were loaded with organic kale, roots and dried blueberries, which she hoped to trade for a month’s supply of rye flour, bean cake and mustard seed oil. Rivulets of misty rain dripped from her face as she slowly pedaled down an old winding logging road; suddenly she stopped dead in her tracks. Piles of scorched plants littered the edge of the muddy path, their leaves riddled with countless tiny holes and singed black on their edges. Cedar stared in horror at what she saw; she knew that this was not the work of ravenous flea beetles, but a sign that the toxic chemical clouds had begun to seep into the atmosphere of the northwest sanctuary. Although she feared that the worst was still yet to come.